Rabbis and guests from 100 countries gather for annual international conference of outreach emissaries. Some 4,700 Chabad-Lubavitch rabbis who work in communities around the world gathered in New York for the annual international conference of shluchim, or outreach emissaries. The conference, which ended Sunday with a gala banquet attended by 5,600, is the movements’s 35th and was held just days after the shooting attack on a Pittsburgh synagogue that left 11 worshippers dead. 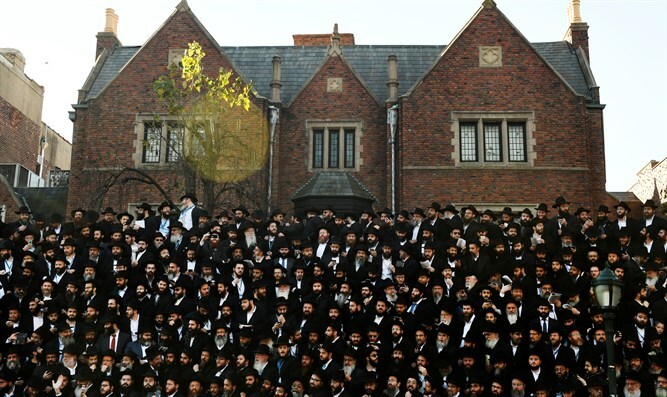 The conference also marked the 10th anniversary of the terrorist attack in Mumbai, India, which killed emissaries Rabbi Gavriel and Rivky Holtzberg and four others at the Chabad center in Mumbai. During the conference, Rabbi Yisroel Rosenfeld, executive director of Chabad of Greater Pittsburgh, led a study of Mishnah in memory of those murdered in Pittsburgh. The highlight of the dinner is the roll call of all the places emissaries are located, including more than 100 countries. Some emissaries joined the proceedings via a live webcast. During the week, the emissaries made a group pilgrimage to the grave of the last Lubavitcher Rebbe, Menachem M. Schneerson, where they waited in line for hours to pray and leave notes asking for blessings. As the number of emissaries and supporters has grown, the movement has struggled to find sufficient space for its annual conference. This year’s venue was a massive repurposed gym at Rockland Community College in Suffern, N.Y. A staff of 484 spent 10,670 hours setting up the hall and serving its 528 tables, according to Chabad.org.